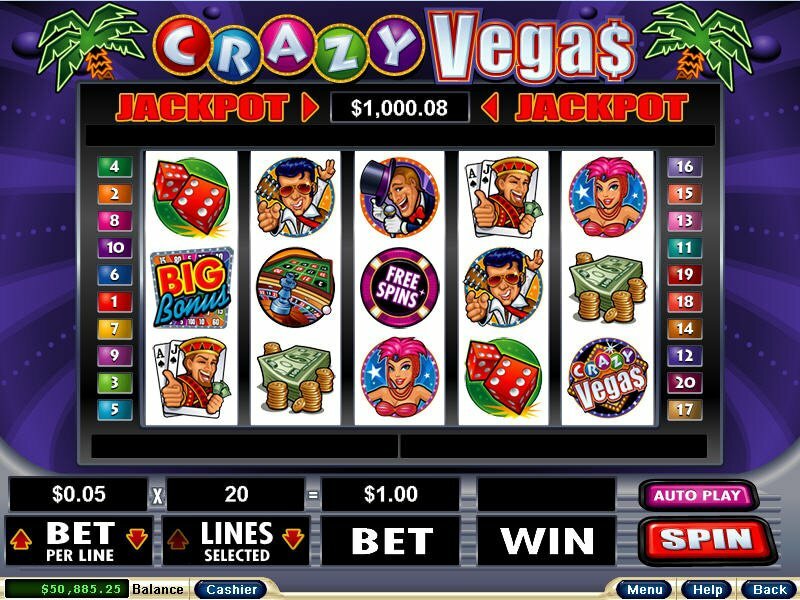 Crazy Vegas is an online slot developed by Real Time Gaming. It has 5 reels, 20 paylines and lots of symbols that match the game's theme, i.e., Vegas as a gambling capital. Graphics is clear and the sounds are reminiscent of a real Las Vegas casino. This review of Crazy Vegas online slot takes a look at the interesting symbols as well as the game features. The highest paying symbol is a pile of cash. It pays 300x the bet amount if you get 5 in a row. The highest winning amount per spin is 50,000 per payline. The Elvis impersonator and the dancing girl are the next top paying symbols with a pay out of 150x. The entertainer and the playing card each pays 90x. The lowest paying symbols are the roulette wheel and the dice, which are both 45x the initial bet. The 'Crazy Vegas' is a wild symbol that could replace any other symbol so it can be used to form a winning line. With regard to bonuses, Crazy Vegas online slot has a lot to offer - free spin, Crazy Vegas and big bonus. Having a progressive jackpot makes this game extra exciting as well. A free spin feature is activated when the green, pink and blue chips appear at the same time on reels 2 to 4. The sum of the numbers on the pink and blue chips tells how many free spins while the number on the green chip is the multiplier. The big bonus is activated when the big bonus scatter symbol appears together on reels 1 and 5. As soon as activated, reels 1 and 5 will spin until the Big Bonus button is pressed. To get the winning amount, multiply the numbers on the two reels then multiply the answer to the bet amount. Getting the Crazy Vegas symbol on all 5 reels three to five times correspond to a bonus that is 5, 20 and 100 times the bet, respectively. If you want to experience the feel of being in a real Vegas casino, Crazy Vegas online slot is the game for you.